Paul was a pioneer in the development and application of radioactive tracers in hematology and cancer therapy. In 1936 he first used 59Fe to study iron metabolism in dogs with anemia due to chronic blood loss. The 59Fe was from the first production runs at Berkeley, in collaboration with Ernest Lawrence and George Whipple. While at Rochester he mentored George Meneely, while finishing his PhD under George Whipple (Nobel laureate, 1934),working with George Taplin, and Joe Ross (two famous hematology nuclear medicine pioneers. The studies were first done at Rochester, where he obtained his PhD in Chemistry. 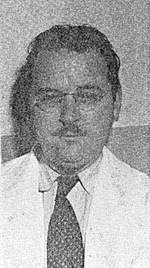 These were further advanced at Vanderbilt University in the years between 1943 and 1948 while he was on the faculty of the Biochemistry Department. Hahn’s 59Fe studies became part of ongoing Vanderbilt studies defining nutritional requirements in pregnancy in some cases complicated by iron deficiency. He organized the first International radionuclide therapy symposia in the USA in 1947, and published a book on the subject. In 1948, he moved across town, to Meharry Medical College which built him a research facility in a new building in which he developed his radioisotope therapy program, with continuing collaboration with former Vanderbilt colleagues. In 1962, Hahn moved to Bethesda, Maryland as the Chair of the new NIH Bureau of Radiation Health Radiation Study Section. He retired, and died in the mid/late 1960s. The roots of the nuclear Vanderbilt medicine program trace from the arrival of Paul Hahn and George Meneely. Paul was a radiation chemist who came from Rochester as an already well respected expert in iron metabolism and tracer methods having published seminal papers in 1938 and 1939 that critically examined iron absorption and utilization. In these he defined the unique character of iron as the one essential food factor where the amount absorbed from the small intestine is rigorously controlled depending on the degree of saturation of iron stores in the body. They showed that only insignificant amounts of iron were normally excreted or lost in the urine, feces, or bile. Iron absorption from the gastrointestinal tract of non-anemic dogs was minimal. However, in dogs with severe hemorrhagic anemia and iron deficiency, iron absorption was substantially increased until body iron stores were replenished. Knowledge of normal and abnormal hematologic processes evolved rapidly at Vanderbilt and elsewhere using stable and radioactive tracer methods. Vanderbilt Nutrition Project: Paul’s first job at Vanderbilt was working under William Darby Biochemistry Dept. Chair) , on a Rockefeller Foundation sponsored nutrition study. A pilot study of radioiron uptake started in 1945 involving 189 children from two Nashville schools demonstrated the feasibility of conducting an expanded population-based nutrition study. In the expanded study, the children drank solutions containing trace amounts of iron-59. Blood samples were drawn two weeks later to measure the amount of iron absorbed based on RBC incorporation. The MIT cyclotron supplied the Fe-59 used in these and most of Hahn’s later studies. In addition, Hahn studied an additional twenty four infants (premature and full-term babies), and determined that the amount they absorbed was in the same range as measured in normal older children. Radioisotope Therapy Research: Hahn was early recognized as a pioneer in therapeutic uses of radioisotopes in cancer therapy, His 1956 book, “Therapeutic Use of Artificial Radioisotopes” is the first published text on the subject. He also published another book entitled Radioisotope Therapy. Earlier, in 1948 Paul had organized the first major U.S. meeting of scientists dealing with radioisotope therapy. The meeting was held in Nashville, and was attended by the major investigators in the field (Hahn 1947 RadioTherapy Meeting). Paul’s major therapy research focused on the treatment of malignant effusions, an interest shared with an equally famous Swiss clinician colleague, J.H.Muller. They were among the first to treat ovarian cancer patients with malignant peritoneal effusions successfully using 198Au colloid. Paul also studied the use of 199Au colloid for the treatment of malignant pleural effusions in lung cancer patients. The colloidal particles were injected respectively into the effusions in the peritoneal and pleural spaces. The basis for the treatment was that macrophages engulf particles and then home in on tumor cells which they recognize as foreign. Since macrophages are phagocytes, when the particles they ingest are radioactive, while attached to the tumor, they cause enzymatic and radiological damage. In early stages of cancer, they were often very effective, but when tumors were large, or when particle mixing in the fluid space limited entry by fibrous adhesions, the treatment was rarely curative, but nearly always palliative. Paul transferred to Meharry Medical School, where he continued his research with radioactive colloids including work done with Meneely at the Nashville VA where Hahn served as a consultant. It is the patients he treated with large doses of Au-198 that were imaged with the crystal ball gamma camera developed by Meneely. The low sensitivity of the device limited its potential use to imaging the high doses given in cancer therapy, and even then it had little practical utility. It was one of the early imaging innovations tested around the time Hal Anger’ s camera was being developed at Berkeley. Hahn and Meneely continued their collaboration until 1962 when Paul left to become Director of one of the NIH radiation research study sections. We later discuss the epidemiological follow-up study of the approx 800 pregnant women in the Vanderbilt Fe-59 follow-up study.